Microfiber couches are made from tiny synthetic fibers making it easy for dirt and dust to become trapped in the spaces in between. This can make your microfiber couch look and feel dirty. With dust particles constantly in the air and children and pets tracking in dirt from playing outside, it’s inevitable that your microfiber couch will get dirty. Microfiber not only looks sleek, but is easy to clean and take care of. Vacuum away loose dirt, dust and debris with the brush attachment of a vacuum cleaner. 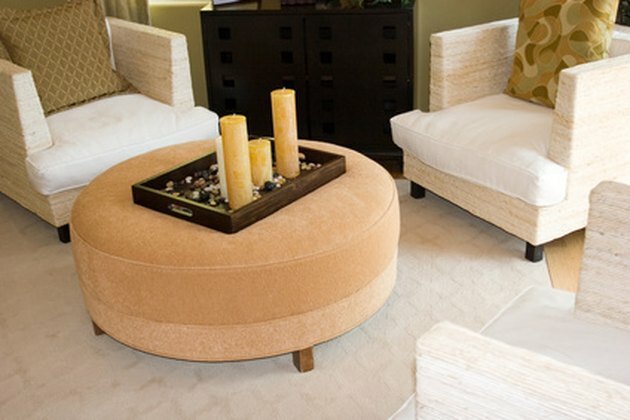 Go over the entire upholstered surface and remove the cushions to get underneath. Remove the cushion covers and machine wash them if the manufacturer's instructions say that they are machine washable. Set the foam cushions aside and cover them with baking soda to help draw out any odors that may have become trapped inside. After one hour, vacuum the baking soda. Flip the cushion and repeat on the other side for another hour. Hang cushion covers outside in the sunshine to air dry; if the weather isn’t cooperating, hang the covers in a cool dry place until they are completely dry. Dry them in the dryer only if the manufacturer's instructions say it is safe to do so. Mix 1 tbsp. dish soap or powdered or liquid bleach-free laundry detergent with 1 quart of warm water in a bowl to make it sudsy. Use a plastic utensil to agitate the water to form bubbles. Dip a clean cloth or sponge into the soapy water and wring it out well. Wipe down the upholstered surface with the cloth or sponge to clean it thoroughly. Dip the cloth back into the solution and wring it out as it becomes dry or dirty to freshen it up and continue cleaning. Wipe down the upholstered surface with a second cloth that has been dipped in clean water and wrung out well to rinse the couch. Place a fan nearby to help circulate air over the couch to help it to dry quickly. Sprinkle baking soda over the couch liberally when it is dry or close to being dry and leave it overnight to help draw out moisture and lingering odors. Vacuum it up in the morning.